No one is surprised that Omarosa Manigault Newman’s new tell-all book is gossipy, salacious, and full of questionable or false allegations. What’s baffling, though, is how a woman who built a career on her closeness and loyalty to President Trump could now knock off Rep. Maxine Waters, D-Calif., as the president’s arch-nemesis. While Omarosa is entitled to her opinion, she’s not entitled to make up facts. When then-candidate Trump asked the black community “What do you have to lose?” by voting for him, he focused on poverty, unemployment, and poor schools. His pitch was that he would create more jobs and opportunities. Minorities have made quantifiable progress under the Trump administration. Black pundits spin it away as the work of former President Barack Obama, and the mainstream media belittles it, but regular black folks are taking note. According to Rasmussen, 36 percent of blacks approve of the job he is doing — up from 19 percent one year ago. The easing of daily financial and educational challenges is likely behind the notable rise in support for Trump among blacks. One of the biggest reasons for this is how the Trump administration's policies are narrowing racial gaps between blacks and whites in employment. Unemployment rates for blacks have remained at historically low rates throughout 2018, and that is commendable on its own. But the gap between unemployment for blacks and the general population is also narrowing. Under Obama, African-American unemployment averaged 12.5 percent, but that has dropped to 7.3 percent under Trump. In addition, the employment-to-population ratio for black Americans (averaged 58.3 percent) is 2.3 percentage points lower than for whites, the smallest gap on record. The president and Ivanka Trump’s emphasis on workforce development has led to commitments from business leaders to train 3.8 million workers and for major corporations like FedEx, General Motors, Home Depot, IBM, Microsoft, and Walmart, to expand apprenticeship programs. This will help even more unskilled black workers obtain employment opportunities and give young black students career paths that won’t necessarily require a four-year degree (or student loan debt). On the higher education front, minority students benefited from spending increases in areas such as increased maximum Pell Grant awards and educational programs that help students from poor and middle-class backgrounds afford college. Historically black colleges and universities, or HBCUs, have fared well under the Trump administration and GOP Congress. From the recent spending bill, HBCUs gained an additional $34.9 million, graduate programs that turn out blacks doctors, dentists, pharmacists, veterinarians, lawyers, and engineers received a 14 percent spending increase, and campus-based child care programs received an additional $34 million so that low-income students who are also parents can further their education. In addition, Congress forgave $330 million in Hurricane Katrina cleanup-related debt held by a handful of New Orleans-area HBCUs. And furthermore, a criminal record may no longer have to be a stumbling block to people of color if this administration’s meaningful effort at prison reform is successful. Our hearts were touched after Trump commuted the sentence of Alice Marie Johnson, a grandmother serving a life sentence for a first-time, nonviolent drug offense. That was a one-off, but the president is looking at systemic change. Trump has convened governors, officials, and clergymen to discuss successful justice system reforms that can reduce crime, keep low-level offenders out of prison, and give former inmates a better chance at starting a productive life. He recently signaled openness to a new proposal on prison and sentencing reform that enjoys bipartisan support in the House and Senate. Jobs, workforce training, education, and second chances go beyond simple engagement with people of color to actually improving their futures. Disparaging Trump for his rhetoric about people of color is popular among black politicians and media pundits. 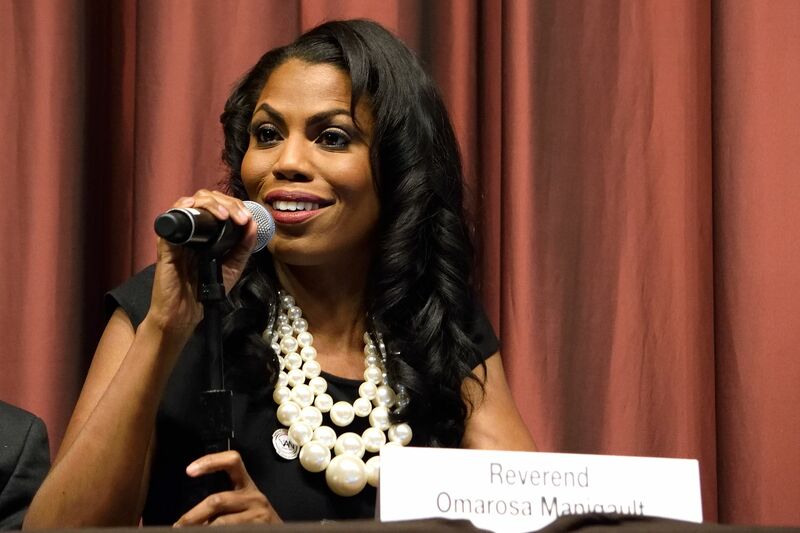 Omarosa assumed that repeating a common refrain about him being racist would catapult her to instant stardom in the so-called “Resistance” movement. But despite her attention-seeking antics, blacks are increasingly recognizing they have a lot to gain from the Trump presidency. The rest is just noise.